Never Mind The Mainstream on KUR (College Rock Radio): Our Fifteenth Show Is Lovely...And Deadly! Our Fifteenth Show Is Lovely...And Deadly! Feeling both aroused AND spooked at the same time is completely normal. More information on the show coming tomorrow. I have a huge paper ahead of me tonight. Jealous? UPDATE: My paper is done, the weekend has begun, and I'm ready to break off a bit of this preview. I'm starting to enjoy the delayed posts. Okay, let's light this candle. Tomorrow is a bit of a hybrid day: not only are people desperately trying to pull together a last minute, sweet Valentine's Day gift/idea for that special girl or guy, but it's also Friday the 13th! Talk about a frightful and potentially unlucky time in people's lives. 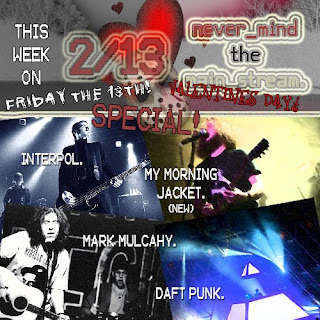 Here at Never Mind the Mainstream, we're going to exploit these hodgepodge of emotions with a special edition of our program: 1/4 Friday the 13th special, 3/4 Valentine's Day special! It's a clever mix and we're just clever enough to pull it off into a superb show. So take a look at the poster: Mulcahy. Interpol. DAFT PUNK. My Morning Jacket. Phew. We got some oldies, some newbies, and a bunch of other tunes that fit either which occasion. We'll be taking calls and requests all show long. So as always, tune in at kur.kutztown.edu and either call in at (610)-683-4058 or IM us @ KURRequest. We'd love to sweet talk you, then spook you. See how much fun we can have with this? Tune in! It'll be a blast!